I was invited to attend their 17th performance last week and I was truly impressed. For the past 20 years, I’ve been a professional hula dancer. I’ve also had the opportunity to learn other Polynesian dances through the Pacific Islanders Club and Hawaii Club at Washington State University. To say that Polynesian culture is important to me would be an understatement. When I take my kids to Hawaii, we always incorporate Hawaiian culture. 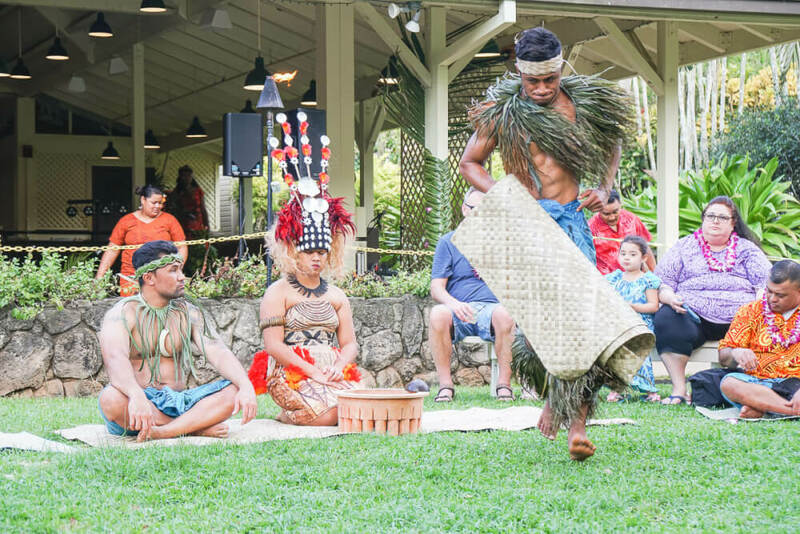 From hands-on cultural activities to a theatrical luau show, there’s always an educational element to our Hawaiian vacation. 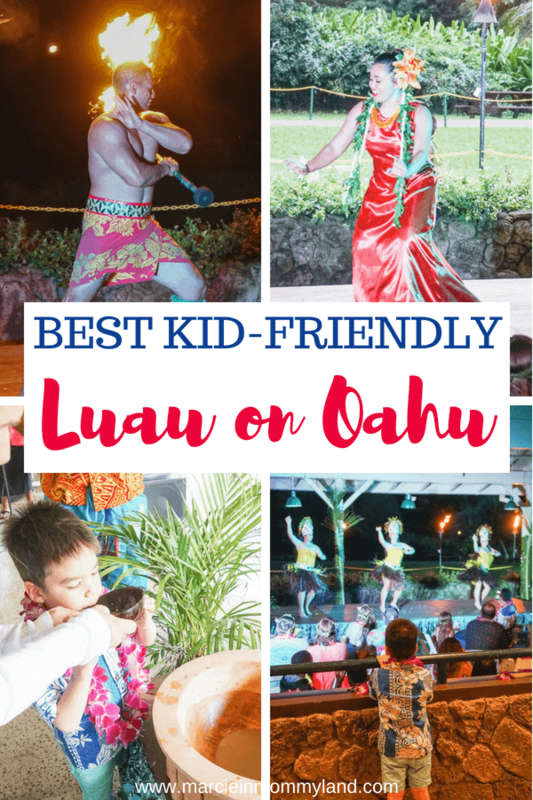 So for our first trip to Oahu, I was on the hunt for a kid-friendly luau that was more authentic than touristy. We were looking for things to do in North Shore, Oahu. 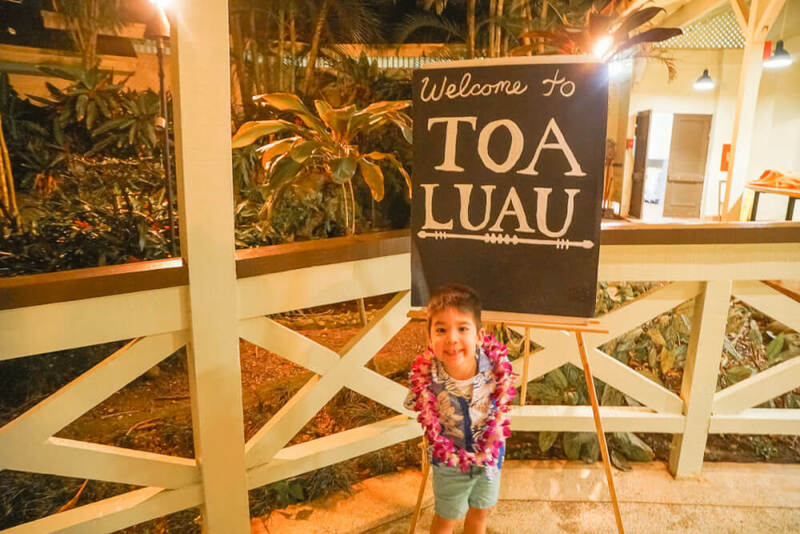 Toa Luau was the perfect fit for my family, including my 4-year-old and 17-month-old. If you’ve been to Hawaii before, you’ll realize that Hawaii is made up of so many cultures, not just Hawaiian. People come from all over Asia and the Pacific Islands and that has made Hawaii what it is today. Primarily, luaus will start off with hula dancing, then do a few exciting Tahitian dances and finish off with the Samoan fire knife dance. That’s all people get to see. 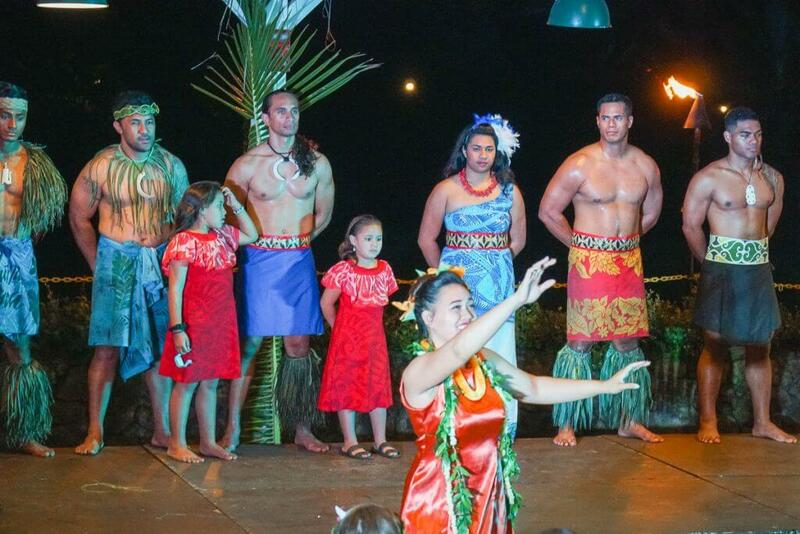 Toa Luau is run by a Samoan family and they are able to show a more encompassing view of Samoan culture. They also have dancers from all over Polynesia who perform traditional dances from their home islands. 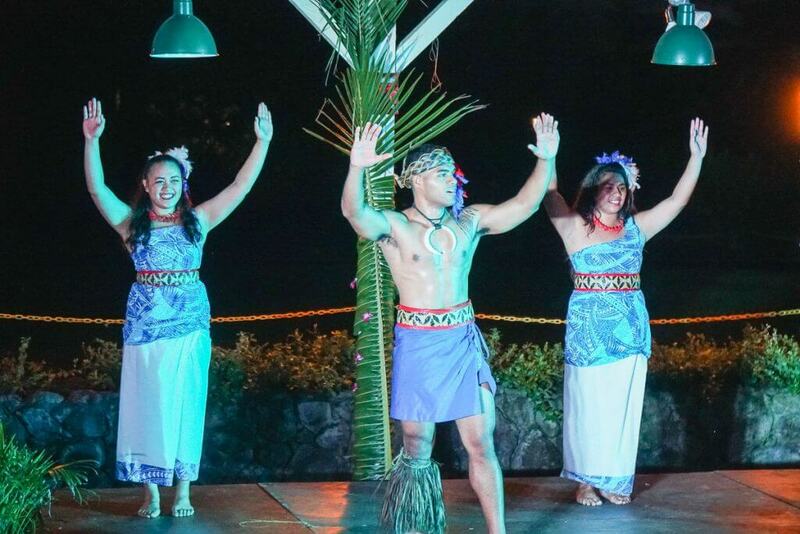 During Toa Luau, we got to see dances from Samoa, Hawaii, Tahiti, Tonga, and New Zealand. 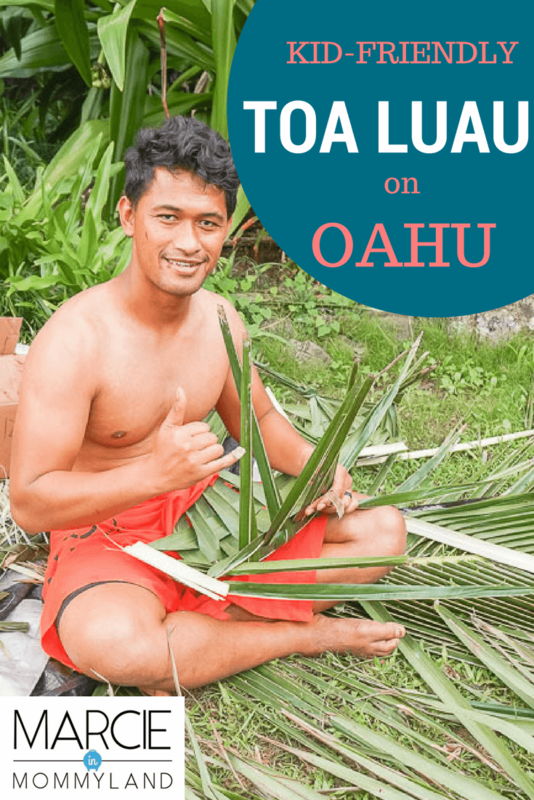 During the first hour, Toa Luau offers hands-on activities and ceremonies. This included weaving head bands that people wore throughout the evening. We didn’t arrive early enough to participate, unfortunately, and my preschooler was disappointed. Next time, we will make sure to arrive on time! At other luaus, performers usually uncover a pig that has been cooking in an underground Hawaiian oven called an Imu. 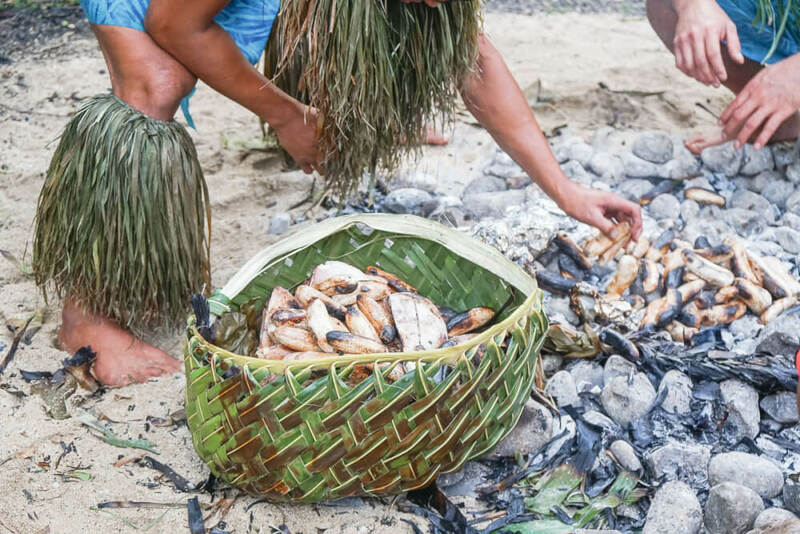 However, since Toa Luau has a Samoan-focus, food is cooked in their above ground over called an Umu. They carefully wrapped green bananas, palusami (taro leaves mixed with coconut milk) and taro and placed on hot rocks. Then they covered the food with big leaves and let it cook for about an hour. We were then invited to sit on the grass where we participated in a traditional Kava ceremony. We all sat in a big circle on mats and chairs. Kava is a drink made from a root that has numbing properties. They explained that chiefs would drink this during negotiations and if they argued, they would drink some more! I’ve also heard that warriors would drink Kava before battle so they could fight through the pain. The ceremony was done in the Samoan language and it was briefly translated so guests understood what was going on. 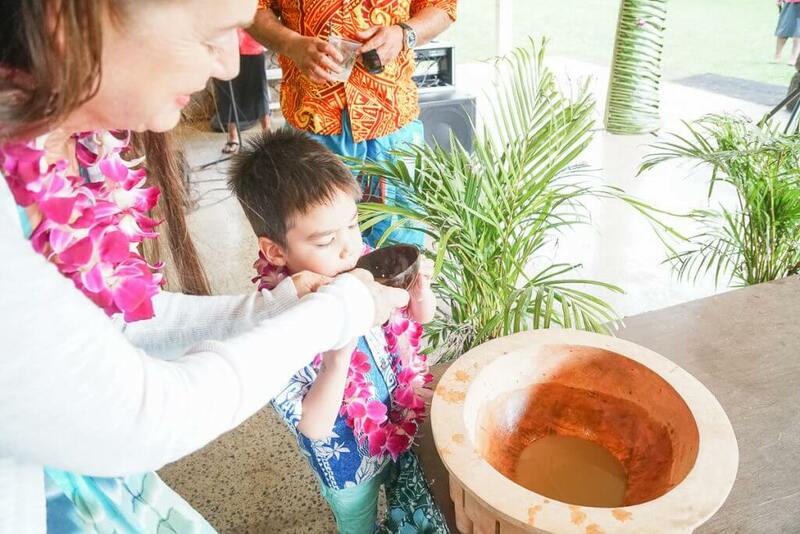 After the ceremony, guests were invited to try Kava before heading to their table. My Mom tried it and said it tasted like “dirty water” and she could feel the numbing effects immediately. My 4-year-old also took a sip and gave it a thumbs up! We also were treated to an authentic dance usually performed by a Samoan princess. Traditionally, this was a big deal because princesses were usually kept away from villagers. My kids loved being able to watch her dance and were even more impressed with her headdress. Apparently, in the old days, the headdress was made from the hair of chiefs after they died in hopes that their knowledge would be passed to the next generation of chiefs. 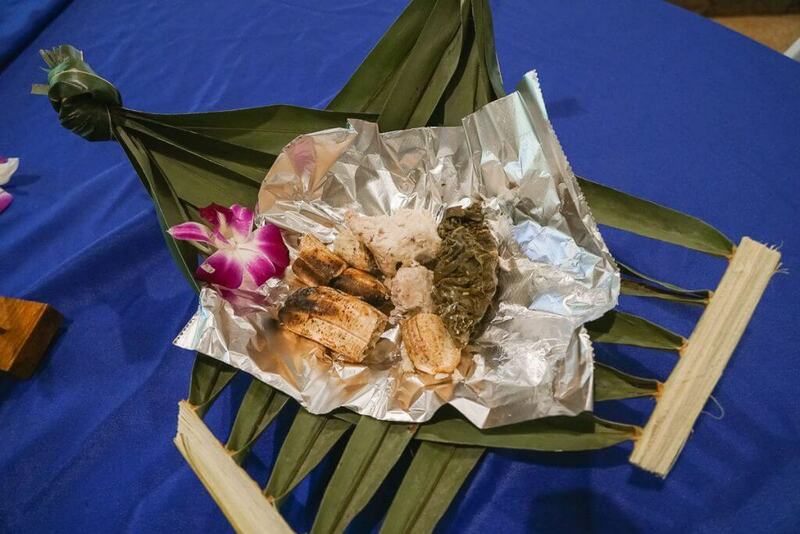 During dinner, guests were invited back out to the Umu to uncover the food. They encouraged kids to use tongs made of the spine of a leaf to help. In hindsight, I should have let my 4-year-old participate along with the other kids. He was completely fascinated! As we headed back to our table after the Umu demonstration, we saw a lady standing at a table weaving with leaves. My son and I went up to see what she was making. Turns out, she was quickly weaving bowls to put the Samoan food in to serve to each table. And sure enough, she brought out the food just a few minutes later in those bowls! The buffet dinner consisted of macaroni salad, green salad, furikake white rice, lomi lomi salmon, teriyaki chicken and kalua pork. It was a bit smaller of a spread than other luaus we’ve attended. The dessert buffet featured haupia, an array of fresh fruit and a yummy cake. What really sets Toa Luau apart is their authentic Samoan food. My Mom and my kids devours the palusami, which is taro leaves cooked in coconut milk. The emcee called it their version of spinach. We would have easily eaten a whole plate of it! The baked taro was good, but even better with a bit of palusami mixed in. My family wasn’t a fan of the green banana, but I’m glad we had the opportunity to try it. When I’ve attended luaus in the past, I usually feel like I’m being herded in a crowd of 300 people. In a crowd that big, it’s often hard to see the stage. And you usually are seated next to strangers at a long table. Toa Luau is completely different. There were 16 round tables. Our table just had my family of four, which was perfect! There is a main floor with staggered tables and an upper deck with one row of tables. Each table has an awesome view of the stage. Plus, there’s room for kids to run around on the grass behind the stage or on the upper deck. My 17-month-old just learned to walk a few weeks ago and was eager to explore every inch of the upper deck. That was fine because I still got a great view of the show! Instead of bringing people on stage to learn the Hukilau or shake their booty to Tahitian drumming, Toa Luau teaches men the Haka. What a fun thing to do in Oahu! If you watch football (or rugby) you’d immediately recognize the Haka. It’s a traditional Maori dance from New Zealand that has recently been a cultural phenomenon as sports teams perform it before big games. I loved the way they presented it! They brought men up on stage and showed them the hand motions. To help them remember, they said a few silly phrases and asked the audience to repeat back some of them. Everyone caught on easily and if you were to watch the dance without sound, it looked like they knew how to dance an authentic Haka! When we first checked in, a young girl presented us with fresh orchid leis. Usually, my 17-month-old doesn’t like to wear leis, but he just beamed as she put on around his neck. And he actually wore it throughout the luau! My 4-year-old also thought it was so cool to see another kid helping in the kitchen. I appreciated my kids seeing other kids helping with their family business. It’s definitely a fun thing to do in Oahu! 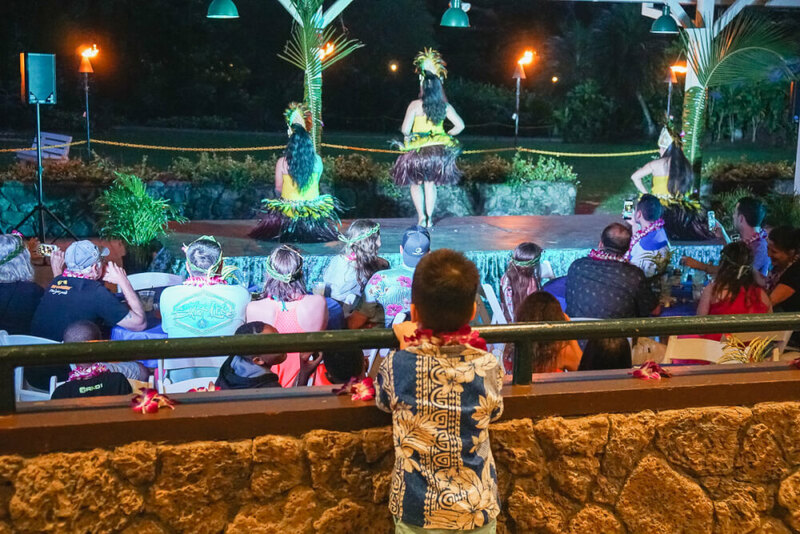 Another thing I appreciate about Toa Luau is that kids under the age of 5 are free. That makes it an economical family activity in Hawaii. 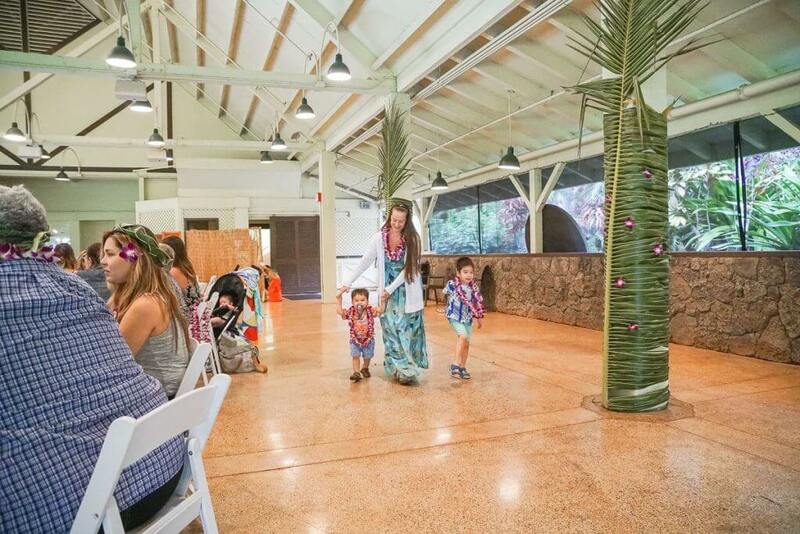 Additionally, I think because kids under 5 are free, more families choose this North Shore luau. Meaning, your kids will be around other kids. My kids love to participate! They want to be a part of whatever we have going on. So, it was really cool that not only could they watch the demonstrations, but they were invited to join in on the fun! Since I have a 17-month-old young toddler, I loved that high chairs were available. I just asked one of the staff members and he quickly brought one to our table. I didn’t expect the Toa Luau to be stroller-friendly, so we left our stroller in the car. However, I saw a few families use them throughout the evening. This is perfect for younger babies who might fall asleep or would prefer to eat in their stroller. I ended up putting my baby in my Tula baby carrier near the end of the show. One of my biggest deterrents for booking a luau in the past is that many of them end at 9:30pm or 10:00pm. That’s just too late for my little kids, especially when factoring in the time change. That’s why Toa Luau immediately caught my eye. During October-February, the whole event is done by 7:30pm. March-September, it’s done by 8:30pm, which is still much earlier than other luaus. It took us 1 hour and 45 minutes to get to Waimea Valley from Waikiki on a Tuesday afternoon. There was an accident on one of the highways. So, if you are coming from Waikiki or Honolulu (or anywhere other than the North Shore) I recommend checking traffic well before you leave. It only took us an hour to drive back to Waikiki. 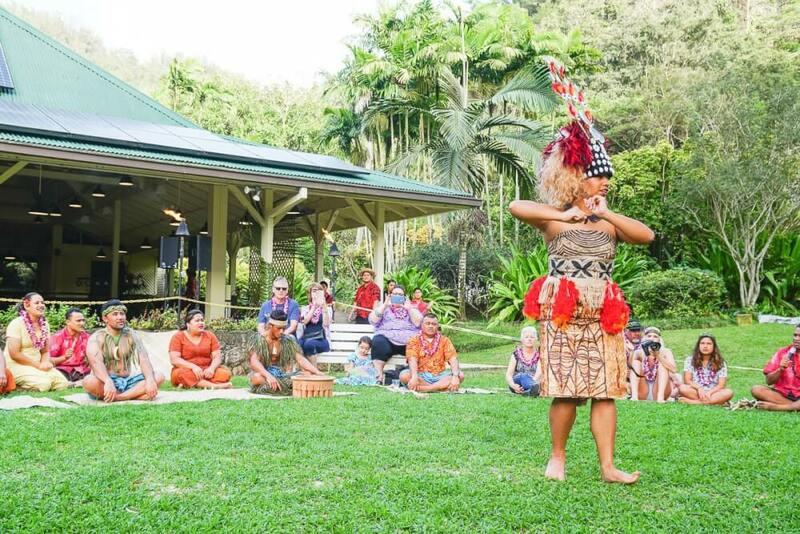 Toa Luau rents a place at Waimea Valley, which is located across the street from the famous surfing spot Sunset Beach. There are so many things to do in North Shore, Oahu. 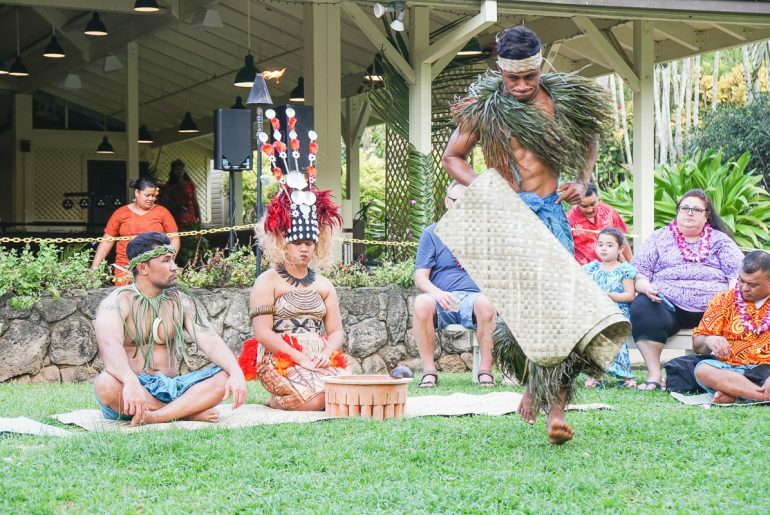 Waimea Valley itself is a spot featuring cultural demonstrations and exhibits. Plus, you can swim at a waterfall! Your luau ticket also provides same-day admission to Waimea Valley. If you want to make a day of it, head to Waimea Valley several hours before the Toa Luau begins. There are changing rooms located at the falls so you can get out of wet swim suits and into your Aloha wear. Or, if you are staying on the North Shore, you can head home to clean up and then return in time for the Toa Luau. Parking is available at the Waimea Valley Visitors Center. When we arrived at 5pm, there were plenty of spots available there because that’s when Waimea Valley closes. If you arrive earlier and the parking lot is full, there is an overflow parking lot. When you arrive, head to the Waimea Vally Visitors Center and walk to the very back. There, you will see a sign for Toa Luau. There will be someone at a booth to check you in and present you with a fresh flower lei and give you your table number and drink tickets. Admission tickets for the Silver Package start at $88 for ages 12+. Kids ages 5-11 are $75. Gold and VIP packages are also available. If this looks like something your family would enjoy on their next trip to Oahu, get Toa Luau discount tickets here. Toa Luau provided me with tickets for review purposes. All opinions are my own. Wow, putting this on my bucket list now. Looks like sooooo much fun. Love all the bright colors and fabulous pictures. Definitely sounds like the Luau destination for families. I love their outfits and that they’re family run. Plus, 5 and under free???? Yes please! It was by far the most intimate luau I’ve experienced and it just felt like everyone wanted to be there! What a great, informative post! Hawaii is on our must visit list within the next few years. I will kee this place in mind. Have a fun time when you get to Hawaii! I agree with the advice here! Leaving for our 4th trip to Oahu, Hawaii May 6. Most “mainlanders make the mistake of overdressing for Hawaii. You live in swimsuits/coverups during daytime. Even at the nicest restaurants in the evening on Waikiki, I wear island top/capris/ sandals and my husbnd wears golf or polo shirts and shorts. I love walking around Waikiki to see what people wear! Usually, I think people are dressing for their IG feed and it’s pretty impressive! Our 1st and hopefully not the last luau experience was one a restaurant in Disney World. It was great but I think it would be better if we’ll do the authentic ones in Hawaii. 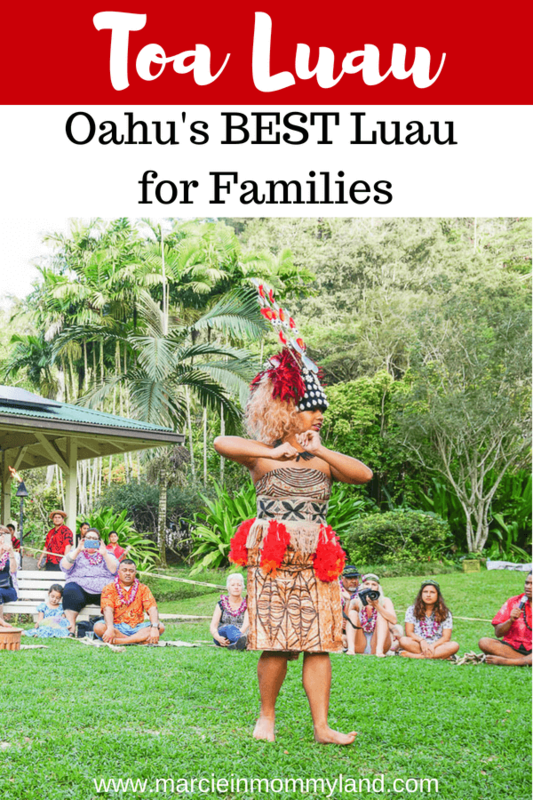 Hawaii is on the list as I have heard it’s a great family destination – this thorough post just validated it even more! Thanks for such a detailed post about the kid-friendly elements. Oh it’s super family-friendly! Almost every tourist I saw had at least one kid with them. And many were there on a Babymoon! Oh my gosh! ? Needing this BAD today – the weather here is FREEZING! This looks like SO much fun!!! I’ve wanted to visit Hawaii for as long as I can remember. I will definitely keep this in mind whenever we finally plan a vacation there. Thanks for sharing! You MUST make it to Hawaii someday! This looks amazing! I love that this focuses more on Samoan culture. I love their style of dance, we watch Samoan videos during our practices sometimes and their hand movements are so beautiful! This seems like the perfect event for your little ones! Yes! It’s so different from hula! This is such a wonderful program! I think that my perception of Luau’s was the Brady Bunch Luau in the 1970’s. This is a wonderful experience that we will have to participate in next year when we go to Hawaii! I love the idea of the hands on participation, and that Samoan food is offered (Two of my children of of Samoan descent). Thanks for sharing such a vivid picture of what a Luau can be! Oh how cool! Samoan culture is so fun! I got to learn a lot about Samoan dancing and food when I was in college and have been dreaming of visiting Samoa someday! I would love to go to Hawaii and learn more about the culture. It’s great that kids can participate and get introduced to local cultural and traditions at a young age. Polynesian culture is so rich with stories, food and dancing. Definitely something people should learn more about! I’ve done a Kava ceremony before. While I didn’t like the drink the ceremony was very special. Oh cool! I didn’t try it, but my Mom said it tasted like “dirty water.” I’ve had a tea with kava in it that I liked. Ahhh I have always wanted to go to Hawaii! Definitely a must- trip in the next few years. YES! Hawaii is a place everyone should experience! Oh how I love Hawaii!!! I have not been to this particular luau but the one I went to was amazing. I plan on going back to Hawaii when my boys are a little older, so I’ll pin this for later reference. Looks like an amazing time! Thank you!! They just launched in October, so it’s really new! I hope you get to enjoy it in a few years! Oh, this place looks like so much fun! I love Hawaii! So do we! I’m already ready to go back! Wow! This looks like an awesome experience! It’s a great way to end a day in Hawaii! I haven’t been to Hawaii (yet) but have heard mixed reviews on the different luau options. We will definitely be checking into this one though because it sounds like one of the better ones. Thanks! We love going to Hawaii when our kids were young and now that they’re older. Always a great experience. I’ve always wanted to go to Hawaii! This looks like an amazing experience. It’s a great place for families, couples and solo travelers! This looks like such an amazing experience! Now all I have to do is figure out how to get to Hawaii and I’m all set! 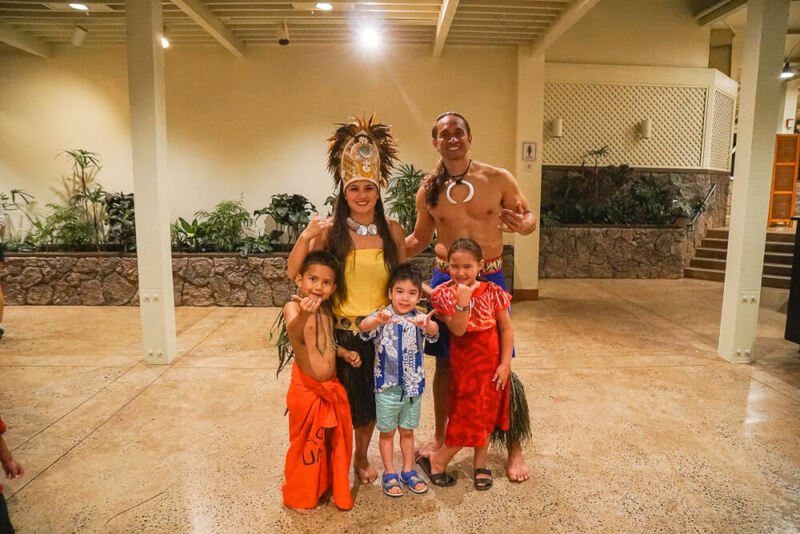 Thanks for sharing about this wonderful luau! I hope you make it happen! It’s a lovely place! Oh that looks like SO much fun!! Makes me want to book a trip to the islands ASAP! This sounds amazing. I want to visit Hawaii so bad. I hope you get the opportunity! My mom lives there, so it’s a great excuse! Ive always wanted to attend an authentic luau! Oahu is one of the top destinations on my list so this is perfect, thanks for sharing! Oahu is a such a fabulous bucket list destination! Wow! I’m definitely bookmarking this page. Never been to Hawaii and i do plan to in the next few years. This sounds like a perfect package for me and my family. Thank you for so much information. You are going to have an amazing trip! Wow! I’ve never been to Hawaii, but it’s on my bucket list. This looks like so much fun. I bet my son would love it! I hope you make it to Hawaii! Such a lovely place! This sounds like such a fun time! We have never been to Hawaii but it is definitely on our list, thanks for all the tips! Hawaii is so amazing for families, couples, and solo travelers! This looks like so much fun! Hawaii is my dream. Definitely putting this on my bucket list! We loved the costumes! And my boys were mesmerized by the fire knife dances! Thanks! We learned so much and had a blast! This is such a great review! I plan to take my daughter to Hawaii when she graduates high school and now I know where we should go and what Luau we need to make sure we have on our itinerary! Yes, do the Toa Luau! You both will love it! This looks so much fun and I’m glad that it is so authentic! It’s pretty new and you can tell everyone really cares about what they are presenting! This looks amazing! Your photos make me feel like I’m there (and not in cold Chicago). Thank you for sharing! Glad I could warm you up a bit! This looks like an epic family experience! My kids would absolutely love being able to do this. One day I hope to be able to take my family to Hawaii! Thanks for sharing your family adventure! I hope you are able to take your kids to Hawaii. It’s gorgeous! What a unique experience that must have been. I love dance in all its forms, and experiencing a luau and watching Polynesian dancing has always been on my bucket list. Oh I hope you get to do that, Astrid! Add it to your travels around the world! Yes!!! I love that it is so authentic and intimate! Luaus can definitely stray away from that so I’m glad you have one you love! Oh, that looks like so much fun! We did a Luau when we were in Kauai and it was such a fun experience! The food is so good! Oh which one did you do on Kauai? We did Luau Kalamaku last year and it included a train ride! Love how it’s a fun learning experience for the kids! The audience participation part looks like a lot of fun.. and very memorable! It was the best audience participation I’ve EVER seen at a luau! This sounds like such a great experience. Hawaii is on my bucket list, so I will be keeping this in mind! Oh you must go! It’s really beautiful and there’s lots of yummy food! Love the Hawaiian Luau’s! This one looks like it’s great for interacting! ps – your son is such a little cutie! That is an amazing experience! I haven’t watched one yet but hopefully the next time I visit Oahu I will be able to. Glad your son had a great time! This one is a lot of fun and educational. I recommend! What fun! I enjoyed the Waimea Valley but didn’t get a chance to do a luau (there or anywhere else for that matter) on my visit, so guess I need to go back! And we didn’t have time to explore Waimea Valley! There’s always SOMETHING! I hope you get your luau on! Such a fun way to spend an evening! Really enjoyed this post. Love how you described and celebrated Pasifika cultures – and their differences! There are so many differences! It’s a fabulous show! I’d love to do a kava bar someday! And yes, you’ll have to go back to Hawaii! I love this! I wanna go to Hawaii but my daughter’s father is like “nope”. LOL Let me go work on convincing him a bit more. You’ve got to convince him! It’s so lovely! What a great experience for the kids, and the food looks amazing! I love how hands on the whole evening was! I can imagine the amount of fun a family can have at a place like Toa Luau. Though I never traveled to Toa Luau but your post just pushed me to give it a serious thought for this summer. 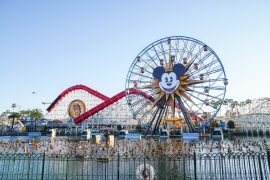 With all those fun activities for kids, my boy will be itching to go there for sure. 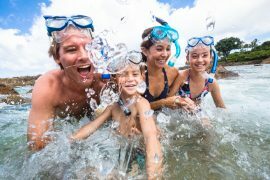 Oahu has so many fun things for families! How much of a difference would the packages be (gold vs. silver vs. VIP)? Would a toddler be missing out with the silver? I think the silver would be just fine! That’s what we did and it was perfect for my toddler! You can sit in the back so your toddler can run around! It’s $35 cheaper than the gold package and the main difference is an extra drink ticket and seating options. VIP includes a souvenir, prime seating, and 2 extra drink tickets.